One of our specialties at XEX is micro bead extensions. 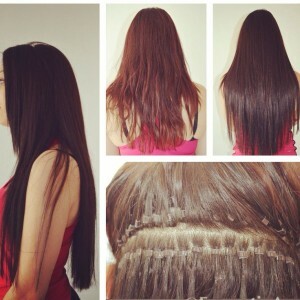 Our Chicago extensions specialists are highly skilled at properly applying micro bead extensions. The result is a beautiful, seamless look. We use only 100% human hair for our micro bead extensions. XEX’s extension specialists use a special tool to run your natural hair through the extension’s ring, then loop it toward the scalp while holding it in place. The extension is then attached to the ring where the natural hair is. When both the natural hair and the extensions are in place, a bead is clamped in place. This process is repeated until the extensions are complete. Micro bead extensions require no heat or chemicals for application. Your XEX extensions specialist will provide you specific care and maintenance instructions. You will need to have periodic maintenance appointments to ensure that your micro-bead extensions remain beautiful. When it’s time to remove your extensions, we will need to do so at XEX.